The first task is to accept Shandalar's quest. Once you have completed his errand, then speak to Mendas. Finally, after his quest has been resolved speak to Ike, Hurgan and Therella to obtain various quests before heading off to Durlag's Tower. Raid two bedside tables, the bookcase and the locked cupboard. To gain the most from Dushai you must have replied "Knowledge is a worthy pursuit..." when you first met Mendas. You can pay Dushai to reveal some background information on Balduran's last voyage. If you are rude to her she will cast a Web spell before leaving. Ike Cascadion Vendar provides guided tours of Durlag's Tower. If you fancy such entertainment then talk to him. Pay a fee then agree to meet Ike at Durlag's Tower. You can meet him after you have completed the other quests originating from Ulgoth's Beard. 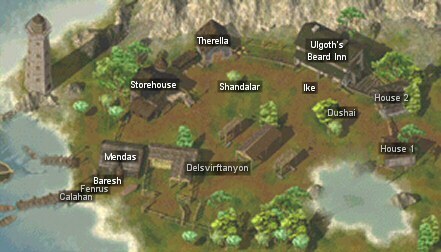 Enter the Ulgoth's Beard Inn AR1001. Talk to Hurgan Stoneblade. He will tell you about the demise of Durlag Trollkiller. He wants you to retrieve a dagger called the Soultaker from a Demonknight in Durlag's Labyrinth L4. Bargain for compensation. His offer will depend on your NPC Reaction. As soon as you return with the dagger you will be ambushed by members of a cult. Be particularly wary of the assassins who will attack invisibly from your rear (vulnerable mages and thieves beware!). During the episode they will steal the Soultaker from you. Enter the Inn AR1001 and talk to Hurgan. He wants you to retrieve the dagger before the cult summons a demon. Head to the storehouse and talk to the Cult Guard immediately outside the door. Provoke him and several cult members will attack. Enter the storehouse AR1003. A Cult Wizard will hail you then his group will attack. Kill them. Again watch out for the deadly assassins. Prepare you party with enchantments such as Bless, Chant, Defensive Harmony, Protection from Evil, Haste and Remove Fear. Enter the demon's chamber AR1002. Tracea Carol will hail you. She will summon Aec'Letec and then her group will attack. Kill her first then all the Cult Guards. If you kill Aec'Letec before having killed all his followers he will take over one of their bodies and continue fighting. Ensure you dispell any Death Gazes placed on your party members otherwise they will transform into Ghasts and attack you! Return to Hurgan and ask for you reward. If you have been following the walkthrough's suggested route then your next destination is the Thieves' Maze. Enter the Ulgoth's Beard Inn AR1001. Talk to Galkin. You can agree to pay his bar tab and he will give you a wardstone. It does nothing useful. Talk to the Bartender. He sells basic weapons, magic items and potions. Raid the locked wardrobe and locked bedside table. Shandalar will approach you. He wants you to recover his cloak from a magic ice prison. You can agree, and you will be teleported to Ice Island just outside the maze entrance, or you can ask for more time to prepare. If you killed his daughters at Oberon's Estate in Central Baldur's Gate he will automatically send you. You will also find a wardstone in your inventory which will enable him to teleport you back to Ulgoth's Beard once you have the cloak. Once you return give him the cloak to conclude the quest. Enter the house AR1005. Talk to Therella. Her son, Dalton, went adventuring in Durlag's Tower and has not returned. She wants you to find him and bring him back. Return to her once you have rescued Dalton. Talk to Delsvirftanyon. He will leave without making any offers if your NPC Reaction is 1-7. He is flogging his merchandise for 500gp. You can agree to buy the lot. However the wardstones are useless. Talk to Fenrus Boulon. He has some background information on Durlag's Tower. You can talk to this fisherman if you replied "Knowledge is a worthy pursuit..." when you first met Mendas. He will reveal some facts about Mendas for a price. He knows nothing exceptional however. Enter the house AR1004. Talk to Mendas. He wants to obtain Balduran's Log Book from Balduran's shipwreck. However to locate it he wants you to retrieve some seafaring charts from the Counting House in NE Baldur's Gate. You can agree to fetch the charts for a price. Once you have the charts return to talk to him. He will tell you to meet him at his boat at the docks. If your NPC Reaction is 8-20 you can say you have changed your mind and can bargain more money from him by saying it will be an arduous journey. Once onboard you will set sail and shipwreck on the Isle of Balduran [South]. On your return from the island you will be approached by Baresh. He tells you to speak to Selaad (in Mendas' house). Enter the house and Mendas (revealed to be Selaad Gan) will explain the plans that you have ruined. He will attack with Baresh. Kill them.